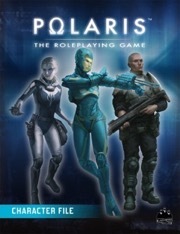 A gaming aid for all players of Polaris Roleplaying Game! It introduces in a few pages the world and timeline of the game, and resumes the major factions and the most important nations of the Deep. The helpful summary of character creation and basic combat rules helps players and GMs alike speed up the gameplay! On the eight pages dedicated entirely to your character’s abilities and equipment as well as your progression you get plenty of space to detail your adventurer! The woodfree paper lets you write and erase on the pages! I would love to have a pdf version of this. Would throw down $5 in an instant for it. But shipping for the hard copy makes a $5 item jump to $16 which is out of my range for an 8 page document.